India’s Forex reserves were $353 billion this week and it seems that the Reserve Bank is stocking up whenever the opportunity arises. The question of course is whether it is just the RBI being prudent or whether they see clouds on the horizon. Certainly the drop in oil prices has helped. But the RBI is still very apprehensive that they could quickly go up again. Right now the forex reserves are sufficient for almost 10 months of imports but the RBI is still not quite bold enough to reduce interest rates further. India has every reason to fear high inflation, but the RBI being a little more expansive is probably called for. Business Line: Between the end of February and March 11, $6.5 billion were added to the country’s forex reserves. This has been the trend over the last 12 months; the Reserve Bank of India has been adding to the reserves at every opportunity. …. India’s foreign exchange reserves are close to record highs even as reserves of other emerging economies have declined over the last 12 months. …. India’s foreign currency reserves (excluding gold) rose close to 6 per cent in the last 12 months. …. China has recorded the sharpest fall (15.7 per cent), while other countries such as Malaysia (13.49 per cent), Indonesia (11 per cent) and Singapore (3.15 per cent) also witnessed depletion of reserves. 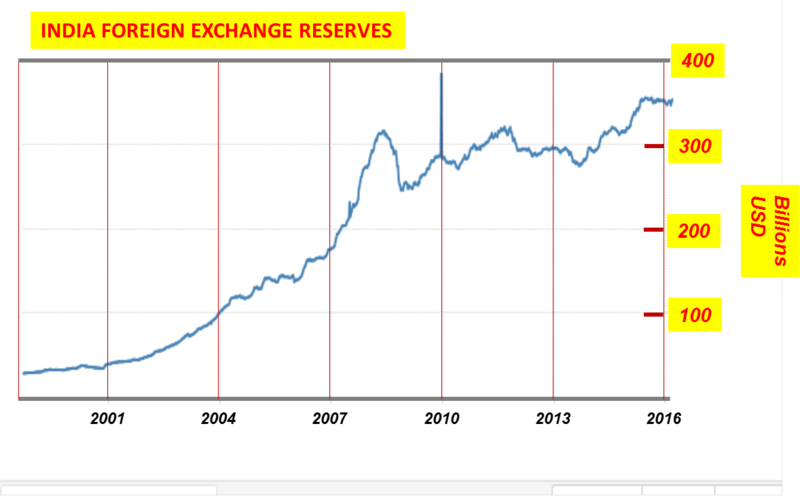 The accretion to reserves in the recent past has taken place under tough conditions. The rupee lost more than 6 per cent in 2015-16, and foreign portfolio flows turned negative in this period with an outflow of $15.3 billion. Foreign direct investments have been the saving grace this fiscal year, with a robust 26 per cent increase in the 11 months of FY 16. The RBI has, however, net purchased $9 billion through forex market interventions between April 2015 and January 2016. While this is just a third of the dollar purchases in the corresponding period of FY 15, it shows the central bank does not want to let go of any opportunity to bolster reserves. This entry was posted on March 21, 2016 at 9:29 am and is filed under Economy, India. You can follow any responses to this entry through the RSS 2.0 feed. Both comments and pings are currently closed.